Willamette Week: If you had a tattoo, what would it be and where would you put it? 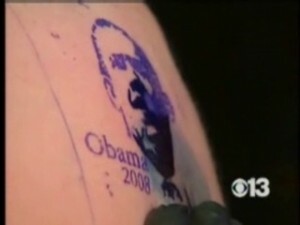 Barack Obama: Uh, I cannot imagine any circumstances in which I would get a tattoo. W.W.: If you were under duress. B.O. : If a gun was put to my head? B.O. : Then I suppose I’d have to have [his wife] Michelle’s name tattooed somewhere very discreet.